After sentence shortened for IDF soldier convicted of stealing classified documents for publication, Anat Kam to be released Sunday. Anat Kam, the IDF soldier who allegedly stole over 2,000 classified documents for "ideological" reasons, is being released Sunday. The release comes after Kam completed two thirds of her three and a half year sentence. She is being released for “good behavior” after becoming eligible for parole, the Prisons Service said. 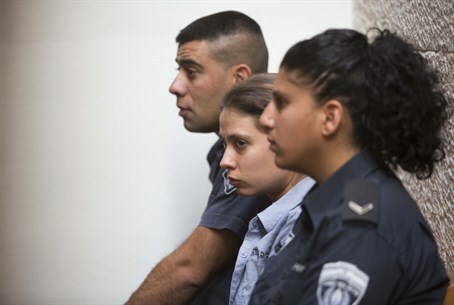 Kam was convicted of stealing the documents during the period of 2005-2007, when she served in the IDF as a secretary in the IDF's Central Command headquarters. She copied thousands of sensitive documents to a disk-on-key (USB drive) which she proceeded to hand over to Ha'aretz reporter Uri Blau. Blau published some of the information in the documents, but he claimed that the information he used was not classified or damaging to the country's security. Kam was sentenced to four and a half years in prison for her theft. The sentence was later reduced by one year, after an appeal by Kam's lawyers that the sentence was unnecessarily harsh. Kam's lawyer, Attorney Ilan Bombach, welcomed the release - and revealed to Channel 10 that the former soldier is still fighting Ha'aretz for "revealing her identity as the source." "She [Kam] relied on the reporter to handle the documents, but not to reveal the source or to publish their own original photos of the documents," Bombach explained. "This is negligence on the part of the newspaper and those responsible for the newspaper - the editor and reporter," he was quoted assaying. Blau, who had absconded to London after Kam's thefts were revealed, later returned to Israel and was sentenced to four months of community service, a sentence he has already finished.